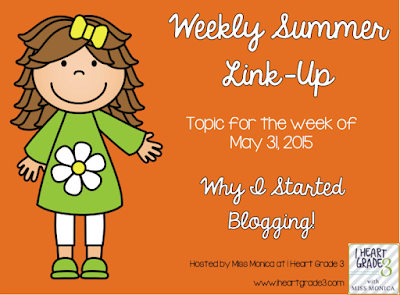 I am linking up with Monica at I Heart Grade Grade 3 for her Weekly Summer Link Up. This week's topic is "Why I Started Blogging." Even though I consider myself to be a digital immigrant (my family didn't get our first computer until I was in Grade 11), I've always enjoyed having a digital presence. Maybe it's because I can be a bit shy in real life, or maybe it's because I teach at in Independent school and feel disconnected from the public teaching realm. Either way, I've had a classroom blog since 2007 (several actually - since I make a new one each time I change grades) and I started my Primary Teaching Resources Blog in 2010. For being a digital immigrant, you're a blogging veteran! I think it's great how you've seen so many changes in the blogging world and have been able to learn from them! I never realized how difficult it would have been to create pages and upload them, I must admit I take those steps for granted! Kudos to having been blogging for so long! Isn't it amazing how technology has changed. I'm from that small generation that bridges the gap between digital natives and immigrants. I grew up with a family computer, but it was mostly for word processing until the start of AOL which came out just as I started my teen years. love how technology & blogging lets us interact with teachers from around the world. It makes the world a little bit smaller to know what other teachers around the world are up to in their classrooms! Oh! Lucky you to have been able to meet up with so many bloggers! 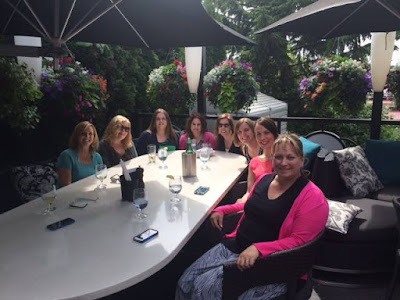 Perhaps we should think of doing a Canadian wide meet-up! That would be fabulous! I recognize a few people in the photo - you were certainly in good company! Yes and I can't wait! It's awesome to hear how you got into blogging. I love the phrase 'digital immigrant.' I've never heard it before! Thanks for sharing your story!